Note: This last school year, I participated in two different preschool co-ops--one for my three-year-old son and the other for my four-year-old son. For the younger group, we focused on a different letter and number each week. For more of my preschool posts, click here. I hope you all don't mind if I finally write up the details to a lesson I did several months ago for my three-year-old son's preschool. It includes some Christmas elements, which, of course, seemed like a fabulous idea when I carried it out in December, but which seem far less fabulous now that it's JUNE. Ah, well. If you want to plan a similar lesson, you can adapt the Christmas segments to something more summery or leave them out or just save the entire outline for December when it will be seasonally appropriate once again. The letter of the week was L, so I chose to focus on different kinds of lights. 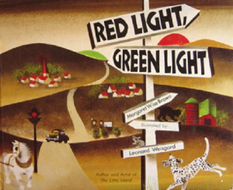 I began by reading Red Light, Green Light by Margaret Wise Brown. The book follows a small town from dawn to dusk and centers around the motion created by the traffic lights: Green Light they can go. Red light they can't. There are many traffic picture books out there, but I specifically chose this one because I love the muted illustrations and the soft rise and fall of the text. Color is used sparingly: mainly black, grey, and brown with splashes of green and red. The subdued colors are especially appropriate as the day fades into night: everyone returns home, the noise and bustle drift away, and the pages slowly become more dark and quiet. The text follows the activities of a truck, car, jeep, horse, boy, dog, cat, and mouse. Their paths cross and then diverge, and their lives intersect in interesting and unusual ways. I love the gentle repetition (The truck came out of the truck's house / a garage. The car came out of the car's house / another garage) with just the right amount of change (The cat climbed down from the cat's house / a tree. (This was a wild cat.)). This doesn't seem to be an especially well-known book, but it is one I would definitely recommend if you get the chance. And it was the perfect lead-in to a discussion about lights. After reading the book, I taught the children a little rhyme called "Green Says Go." I got the idea from RovingFiddlehead KidLit. But honestly, the kids were just happy saying the rhyme and acting it out, so I really think it would have been better to just prop up a picture of a traffic light and then have fun acting it out without worrying about covering and uncovering the various lights. Then we went to the kitchen to make our own traffic lights. I got the idea for this project here. I gave each of the kids a black piece of cardstock (1 1/2" x 8", folded in half), two green circles, two yellow circles, two red circles (all cut out of craft foam), and a 24" circle of braided red yarn. They glued the circles to the front and back of the cardstock. Some were more generous with the glue than others. Then we put the yarn between the fold of the cardstock and glued the sides together. And finally, it was ready to be worn for a rousing game of Red Light, Green Light or just shown off as a pretty awesome fashion piece. Next, I wanted them to be able to experiment with light and shadows. I threw up a sheet in our basement and plugged in a lamp behind it (okay, I lied--Mike set the whole thing up, but it WAS my idea). Then the kids took turns going behind the sheet, while the others stayed on the stairs to watch the shadow show. They also wanted to see what two people looked like and also what would happen if one person was close to the light and the other person was farther away. In keeping with our light theme, we stuck birthday candles into the lemon bars. I had a feeling that this would be the favorite activity of the morning, and it totally was. What three-year-old doesn't like blowing out a birthday candle? They still really wanted to sing "Happy Birthday" even though it wasn't close to anyone's birthday. But then one of them suggested that we sing to Jesus (remember, we were doing this in December). I love how perceptive kids are. 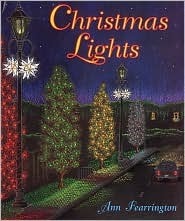 After the snack, I pulled out another book: Christmas Lights by Ann Fearrington. One of our favorite activities in December is driving around at night and looking at Christmas lights. This book is one family's tour around their town. The reader gets to see all kinds of lights--from elegant trees in the forest to a tacky snowman at the fast-food place. Of course, seeing the lights in real life is definitely better, but at 10:00 in the morning, that wasn't really an option. I think this book captures the real experience so well that if you have gone for a drive at night to look at lights, then looking at these pictures will instantly take you back to your own memories. A few weeks before planning this preschool lesson, I had seen this adorable thumbprint Christmas light craft. When I started putting this lesson together, I realized it would go along with the theme perfectly, and I was so excited to have a reason to help the kids make one of their own. Prior to that morning, I free-handed a light string on a piece of cardstock for each child, leaving off all the bulbs. I ended up helping with the entire process of dipping each child's thumb into different paint colors and placing it on the paper. Slightly older children could have done the picture completely on their own. Besides the letter "L," this preschool lesson also featured the number 12. I had seen a cute idea for a Santa number game at No Time For Flashcards and thought I could adapt it to stay with our light theme. I printed several full-page light bulbs and then covered them with the numbers 1-12. All of the "game boards" included all 12 numbers, but there was some variation, as some of the boards had three 2's while others had only two 2's, etc. Each child received a game board and a pile of cereal (for game pieces). We played the game like this: one child rolled the twelve-sided die (stolen from the game Killer Bunnies) and then covered up the corresponding number with a cereal piece. Then he passed the die to the next child and she would do the same thing. The idea was to continue playing until one of the children filled up their entire board, after which they would be called the winner. But in the end, eating the cereal was more fun than putting it on a boring piece of paper, so we wrapped up the game a little early. However, as I was preparing this post (six months later...), Aaron and Max saw the game boards, and it was like an entirely new activity for them (one of the benefits of waiting six months to post anything). They had so much fun rolling the die and finding the numbers. It actually worked far better with two kids than five and was a great way for Maxwell to review his numbers. As long as I'm doing a little Christmas in June, tomorrow I will be posting the lesson I did for Aaron's preschool in December. And then, I will leave all things Christmas until at least November. Promise. P.S. I am sharing this post with Show-and-Share Saturday and the Kid's Co-op. I have never heard of the game "Killer Bunnies" is it fun? Those are pretty cool dice, regardless. Lots of fun things... I'm going to be perusing these posts a lot more next year- hopefully I can get a similar group started for Tag here.